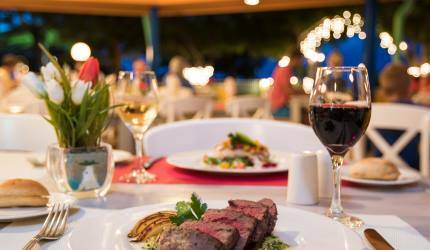 Located in Savaneta, the Flying Fishbone restaurant accommodates its guests with their famous on-the-beach dining area. 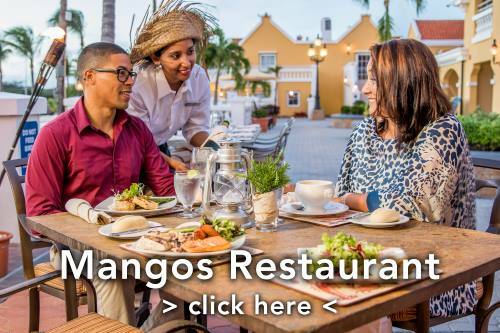 Enjoy a variety of freshly prepared gourmet seafood or meat dishes underneath a star filled sky, with your feet in the sand while listening to waves gently breaking on the shore. Hilton our waiter was the best. Thank you so much for all your recommendations. We could not have had a better night. The food was great also. Tuna tataki and Peruvian Ceviche started us out right. Wow! Sabanete Seafood History and special Unicorn fish with mussels and shrimp over potatoes. Were both awesome. Really exceptional. Thank you for a memorable night! Our annual trip to Aruba would not be complete without a dinner at Flying Fishbone. Each year, the experience is superb. Nothing can beat the ambiance. 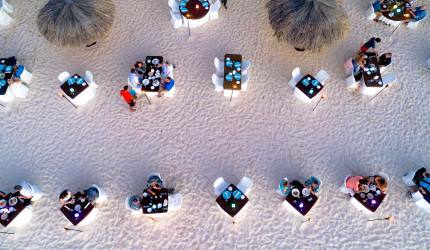 of choosing (in advance) to dine either on the beach with feet planted in the sand or in the Caribbean Sea (where your table is seated in the shallow end of the water. Food selections are plentiful and prepared to our finicky liking. The service is superb. Our server, HYLTON, repeatedly came by to ask us if everything was alright and if we needed anything else. The hostess did the same. At the end of the meal, HYLTON actually came by to shake our hands and reminded us about the foot wash station before we placed our sandals /flip flops back on. Oh yes, there is a table side customized stand that not only houses your ice bucket with your wine selection but, is able to “House” your footwear while you are dining. Flying Fishbone was highly recommended to us and did NOT disappoint. Our waiter, Kemar, was wonderful. We hope you enjoy it as much as we did. My wife and I spent the last three nights of our vacation in Savaneta. The Flying Fishbone was close so we gave it a try our first night. Upon arrival we were greeted and made to feel welcome. While we didn't sit at on of the water tables, we had a nice table where we could enjoy our cocktails and a nice dinner as the sun set on the sea. The catch of day was Red Snapper and it was delicious. My wife opted for the lobster bisque with a salad and was not disappointed. Romel, our waiter did a great job. It was the last night of our vacation and we went back and were seated at a wonderful table, still in the sand, that made for a memorable meal and sunset. We were lucky enough to have Romel again to make our evening enjoyable. The Red Snapper was as good as the first visit. Overall, a great two experiences. This place is amazing! While my family and I didn’t sit in the water, our table was just up from that area sort of by itself with an unobstructive view of the water and sky. It was a lovely spot. I felt special! From the time we arrived the service was exceptional. Everyone seemed to have perfect timing. All were hospitable, friendly and professional. They all truly cater to the diner. Hilton, our server, is possibly one the best I have ever met. Totally professional yet friendly. Made the experience all about us! I had the tenderloin which was prepared as requested. Everyone else ordered fish and shrimp and all enjoyed and said it was excellent. Two of my dining companions ordered cocktails and said they were great and not watered down which is something we have noticed at various bars. I highly recommend this place and will be back when I visit again and should that never happen, I will always remember this place!! Julian was incredible and made our dining experience one we will not forget! We had a table in the sand and even with rainy and overcast weather it was beautiful! The food was great and the portions are big! Would definitely recommend flying Fishbone and Julian to everyone we know! We enjoyed two wonderful meals during our vacation at the Flying Fishbone Restaurant. 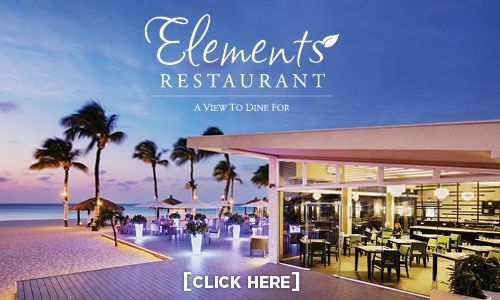 The ambience exceptional, the food delicious and plentiful, and the service unparallelled. The security at our resort recommended the restaurant. We went last week for our anniversary with friends and had a memorable experience. We were seated immediately. The view of the ocean and beach was superb. We watched the sunset and reflected on the wonderful vacation we enjoyed. Our waitress, Weng, was absolutely superb!! Weng was very attentive and ensured we had a wonderful experience! Everything was fantastic. We returned to the restaurant with different friends this week. We again enjoyed a wonderful experience and so did our friends. Our friends said they would be returning to the Flying Fishbone on future trips to Aruba. 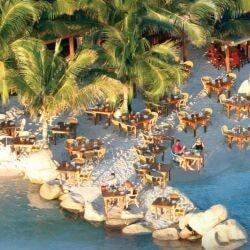 My bride and I will certainly be returning to the restaurant on future trips to Aruba. Thank you for the experience! We have Been coming to Aruba for over 13 years ... heard good things about the Flying Fishbone, but never made the trip over until this year. Our family finally went to dinner and had the best experience. Great food and atmosphere. Our waiter, Hylton, was terrific too! Highly recommend the 40 minute trip ... it’s worth it! This was our second trip to Flying Fishbone. The first was celebrating 6 months of dating and now we celebrate our honeymoon. We ate with our toes in the water and had the most delicious meal. Our waiter, Hylton was fabulous and came out to surprise us with a brownie and sparklers to celebrate the occasion!